This is one of my favorite times while on the Island of Roatan….hanging out at Herby’s with some of the boys from French Harbor. 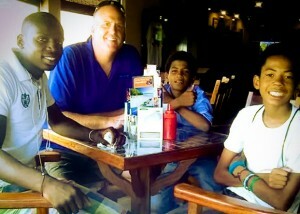 One afternoon I took the boys for lunch and we had a great time talking and sharing about life. I had a great time with Bebe, Jarvey and Pablo, the mealtime passed way too quickly. Summer of 2014 was a year of big transitions for myself and our family so I missed the opportunity to travel to Roatan. 2015 is looking much better. We are in the beginning stages of planning a trip to Roatan for July 18 – 25th. Rayann and I will be traveling back to spend a week with the people of the island who have captured our heart. Rayann and Bebe keep in touch via text and facebook on a regular basis. It will be good to sit down over lunch and catch up on life.